The DL441 Quad Auto Compressor/Limiter captures four channels of Drawmer’s innovative DL241 ‘Auto Compressor’ in only 1U of rack space. The inclusion of new sophisticated ‘automated’ circuitry allows the engineer to precisely control both the dynamic range and ‘absolute’ peak level of the programme instantly, without sacrificing essential control parameters. This perfect balance of features makes the DL441 ideal for use in sound reinforcement and outside broadcast applications where an economy in rack space is essential. Each channel combines a fully professional ‘Auto Attack/Release’ Compressor with a variable threshold ‘Peak Level’ Limiter on the output providing a transparent ‘endstop’. High resolution bar-graph displays on each channel allow gain reduction and output level to be viewed simultaneously, of particular importance in darkened concert hall or control room situations. Compressor: The compressor section can be switched to provide either HARD or SOFT knee compression In both the HARD and SOFT modes a Ratio control is available. In the SOFT mode the ratio increases gradually over a 10dB input level range until it reaches the ratio set on the front panel control, thus achieving a more natural sounding compression In HARD mode the compressor provides a more precise means of controlling gain, where the ratio as set on the front panel is applied immediately the signal exceeds threshold. This is particularly useful in many broadcast applications. HARD knee compression can also be used creatively as an effect, particularly in the treatment of drum and guitar sounds, or for giving rock vocals a ‘compressed sound’. Auto Attack and Release: removes the need for manual adjustment by producing a response which constantly follows the dynamics of the signal. 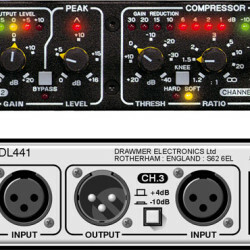 This enables the DL441 to preserve crisp transients without allowing excessive peaks to occur. A smooth yet lively recovery from compression minimizes side effects such as ‘pumping’ and ‘breathing’. This feature is particularly valuable when the program being treated does not have predictable or consistent dynamics, such as complete mixes, vocals or ‘slapped and pulled’ bass guitar. Peak Level Limiter: ‘Zero Response Time’, ‘Zero Overshoot’ circuitry provides an absolute limit to the peak level of the output signal, adjustable from 0db to +16dB above system level. ‘Zero Response Time’ transparent limiting means that the DL441 provides complete protection from even the fastest and shortest signal overloads, making the unit ideally suited for speaker system protection in sound reinforcement applications. The sophisticated circuitry will also prevent unpleasant distortion when used for digital mastering. Metering: Comprehensive bar graph displays give ‘at a glance’ indications of gain reduction, and input/output signal level Gain reduction from 1dB to 30dB is shown simultaneously with signal level from 10dB to +10dB. When the channel is in BYPASS the output bar graph displays the input signal level. Other single LEDs indicate function status of Hard/Soft compression, Bypass, Peak Limiting, Linking, and Power on. Bypass: A fully balanced hard-wire bypass connects the input directly to the output allowing signal to pass through the unit with no power applied. Stereo Linking : Channels 1-2 and/or 3-4 can be stereo linked, where the left channel of the stereo pair becomes the master. Operating Level: The operating level of the DL441 can be instantly switched, independently on each channel, for either +4dBu or 10dBu operation using a rear panel push switch. Input/Output: The DL441 is provided with balanced inputs and outputs on XLR connections. Site by Jennifer Web Design.